New York City's courthouses and holding pens are rife with problems — from a lack of elevators for people who use wheelchairs to poorly marked, separate entrances — that make them inaccessible or unduly difficult to navigate for people with physical disabilities, according to a new report. Some detainees in Manhattan who are in wheelchairs have been carried down flights of stairs by jail guards after arrest to be booked and processed, while in Staten Island improvised criminal court proceedings for defendants in wheelchairs are moved to the first floor because there's no elevator to the second floor courtroom, the investigation by the New York Lawyers for the Public Interest found. "One thing we found was that the only way for a person who has a mobility impairment to access a courthouse is through a makeshift arrangement that negatively draws attention to his or her disability," said Navin Pant, a staff attorney and a co-author of the 20-page report which was provided to The Associated Press ahead of its release on Tuesday. "The injustices are found in all different ways and they really add up to a denial of equal access," he said. The report, based on a review of 10 of the roughly 30 courthouses and holding pens in all five boroughs by attorneys and advocates for the disabled, is a first-of-its-kind comprehensive look at courthouse accessibility, said City Councilman Rory Lancman. The Queens Democrat will hold an oversight hearing on the matter and is introducing legislation that would require an annual accessibility audit by the city agency charged with maintaining courthouses. "I'm not sure there's a culture of access in the courthouses where very simple signage could make it much easier for disabled people to navigate the courthouses," he said. "The issue has been dealt with on an ad hoc basis for far too long." In New York, the courts are maintained and operated by various government agencies: the city Department of Citywide Administrative Services owns and maintains them, the state Office of Court Administration operates them, and the Department of Correction and even the Police Department control detainees and inmates in certain areas. Some of the city's courthouses are close to 100 years old and difficult to repair. In the past decade, eight new courthouses have been built. Ron Younkins, executive director of the state Unified Court System, said the Staten Island courthouse where impromptu hearings for defendants in wheelchairs take place was built in the 1930s and is scheduled to be closed next month, its business moved to a newly constructed Americans with Disabilities Act-compliant facility nearby. "We take this very seriously not just because it's a legal issue but because it's an access to justice issue," he said. City officials are "fully committed to providing all New Yorkers with full access to our city's facilities" and are reviewing the report's recommendations, a City Hall spokeswoman said. The report found that signs at the vast majority of courthouses were poorly displayed, didn't accurately indicate the location of accessible entrances or incorrectly said a bathroom was accessible when it wasn't. It also found that courtroom design flaws, such as jury boxes or public seating areas without a handicapped spot, might impair how people with disabilities hear, see and participate in court proceedings. 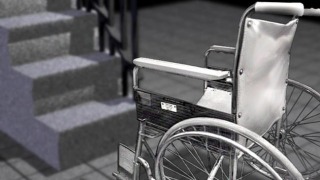 Jose Morales, 48, who is paraplegic, said in a telephone interview from Rikers Island that he was physically carried down two flights of stairs in Manhattan Criminal Court to central booking when the elevators weren't working two years ago — something he said other inmates in wheelchairs also experience. "If the elevators aren't working the only way they can take us is carrying us," said Morales, who is being held on a drug possession charge. "It was dangerous."